Hyundai has made the jump from being a new Korean brand in the UK, making cars that represent good value for money, to offering cars that are the equal to most others in their class. 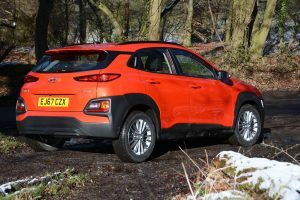 The Kona suggests that Hyundai has now progressed beyond this stage, to offering cars that are also fun to drive – and it happens to be a small SUV that achieves this – in other words the type of car that everyone seems to want. 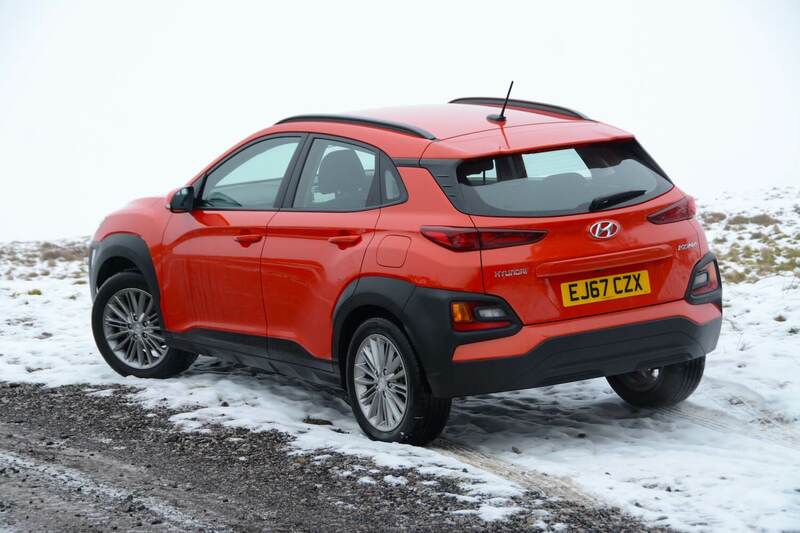 The Hyundai Kona is based on the same platform as the Kia Stonic (which in turn is based on the Hyundai i20/Kia Rio). It’s personal preference as to whether you prefer the exterior styling of the Kona or the Stonic. 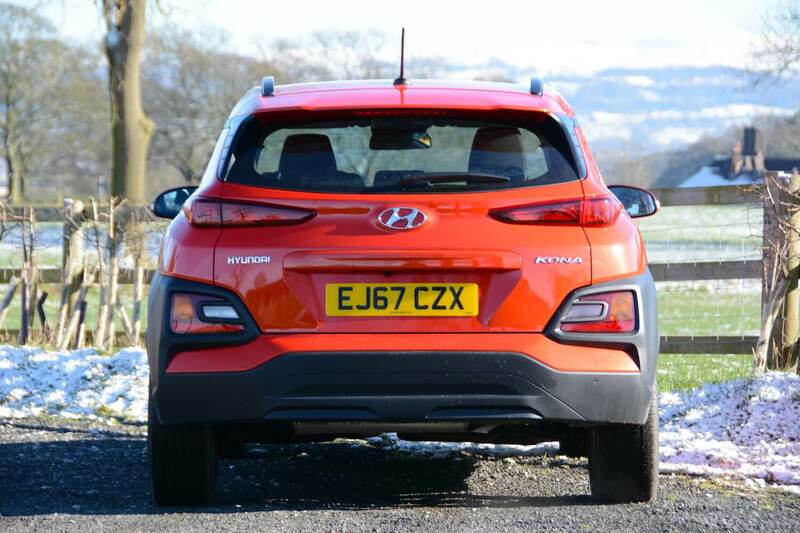 We’d say that the Stonic has the edge – slightly – in the interior department at least, although our Stonic test car was a First Edition compared to the more basic SE trim of the Kona. And in our opinion the Kona looks better with simple, open alloys – the wheels on our test car were too fussy for the overall body styling. Both cars are a compact size on the outside, yet a practical size inside. The Kona test car featured a 120PS turbocharged 3-cylinder, 1.0-litre T-GDi engine with a 6-speed manual transmission and front-wheel drive – the same as the Stonic that we tested. 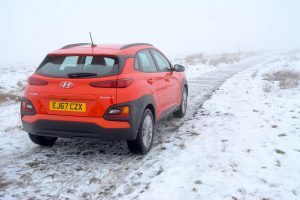 The Kona driving experience starts with having to put a key in the ignition – something that’s becoming increasing rare on cars these days (and there’s also a traditional handbrake: a good thing in our view). 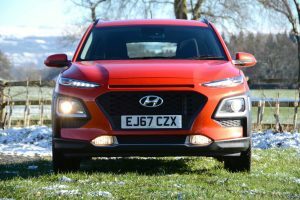 In terms of the driving experience thereafter, let’s get straight to the key headline message (and one that may surprise you): the Hyundai Kona is really good fun to drive. Our week with the car included the requirement to drive over the Pennines via the Cat & Fiddle road near Buxton to a new car launch event. This journey showed that the Kona feels compact, light, revvy, responsive and agile. These qualities are also present when driving in the city, which is also a fun driving experience, however you can’t quite exploit these qualities to the full in a built-up area. But the compliant suspension and the comfortable ride certainly offers a huge benefit on the roads around Trafford in South Manchester, where there are more potholes than stretches of smooth tarmac. 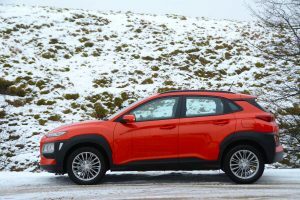 The Kona proves that you don’t need an engine with lots of power to have fun (it’s a downsized 3-cylinder, 1-litre unit). The manual gearbox and clutch aid the immediacy of responses. 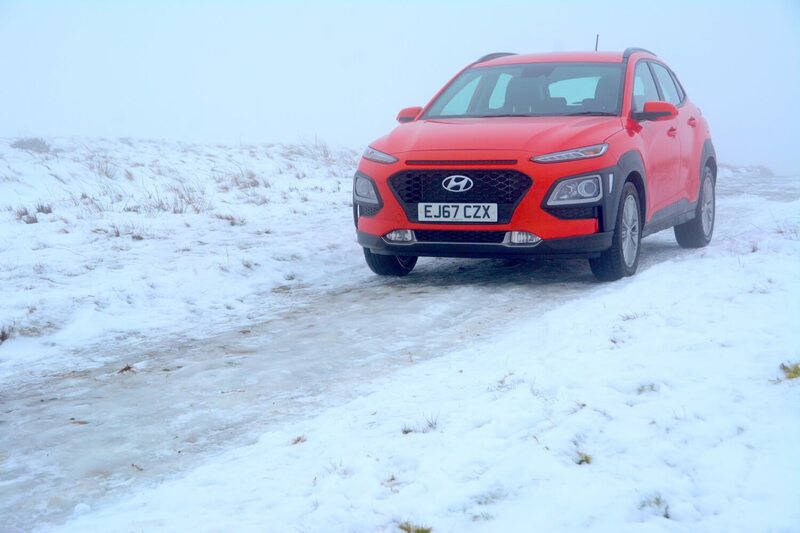 The Kona also shows that you don’t need rigid suspension, or lots of grip to have fun, as the front tyres exhibited very low levels of traction. Admittedly, the road surfaces ranged from cold and wet to snow-covered, but we would expect similar low levels of grip from the front-wheel drive chassis in most wet or damp conditions all year round. The Kona is also much better on the motorway than you might expect in terms of road noise and refinement. However it doesn’t feel as though it’s the most planted car at motorways speeds – the tyres may possibly be a contributing factor here also. The engine generally isn’t intrusive, but you’re certainly aware of its characterful 3-cylinder soundtrack if you push it beyond its comfort zone. The Kona has a clear, sensible dashboard, and traditional heating controls, allowing you to get in the car and flick the temperature up or down quickly – which is much, much better than having the heating controls hidden away in the touch screen. There’s no satnav, but there is Apple Car Play, enabling you to connect your phone and use Google Maps for navigation. 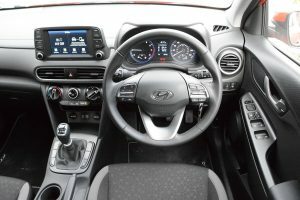 The Hyundai Kona SE 1.0 T-GDi 6-Speed Manual 120PS has an official combined NEDC fuel economy figure of 52.3mpg, equating to 125g/km CO2 emissions (for 17 and 18-inch wheels). After a week of mixed driving, our real-world economy was 41.4mpg. At 70mph on the motorway we averaged 38.9mpg. However we did achieve an average of 45.4mpg after ‘normal’ driving on A and B-roads, and 61.5mpg when driving very carefully on such roads. So the Kona has the potential to be very economical if driven carefully. It also has a decent driving range of over 400 miles. 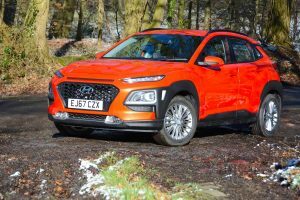 SUVs typically aren’t the most efficient of body styles, as they’re generally bigger and heavier than saloons or hatchbacks, with poor aerodynamics, however the Kona isn’t really a typical SUV. 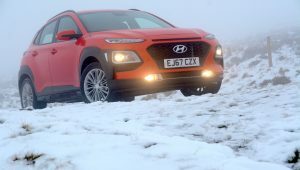 The Hyundai Kona is currently available with two petrol powertrains, the 1.0 T-GDI (120 PS) Manual 2WD as tested, and the 1.6 T-GDI (177 PS) DCT 4WD (with 153g/km CO2) (a diesel engine choice is due to be added). There are five trim levels: S, SE, Premium, Premium SE, and Premium GT. Prices start at £16,445; our test car cost £18,060, and the top of the range 1.6 T-GDi 177PS Petrol 4WD DCT Premium GT Two-Tone Roof costs £26,230. 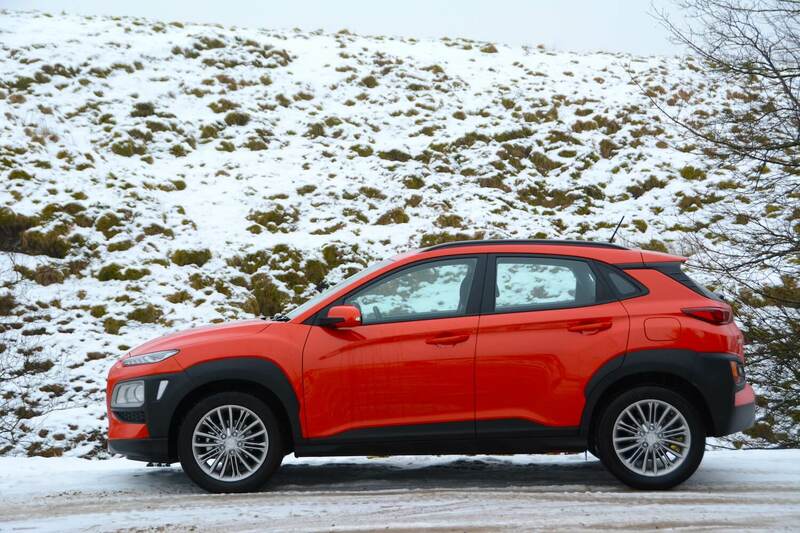 The Hyundai Kona is fun to drive, both around town, and out on the open road. The secret to its agility is its light weight – just 1233kg. This also helps its economy. Its official economy of 52.3mpg is decent for a petrol ‘SUV’. But is the Kona really an SUV? In our view, not really. It’s just a small hatchback with a slightly raised ride height – and fresh styling. But whatever you want to call it, it’s compact, practical, and doesn’t really have many faults – perhaps with the exception of the limited grip from the front tyres. So the Kona gets our thumbs up; the decision that you’ll have to make is whether to go for the Hyundai Kona or the Kia Stonic – both share the same platform and engines, so it’s just down to personal taste about the respective styling of the two cars. But before you rush out and place an order, there’s something you need to be aware of. The Kona Electric has recently been announced. There will be two versions, one with a range of almost 300 miles. No prices have been confirmed yet, but if the pricing is competitive, which we hope it will be, the Kona Electric could be a game changer. We love the way that the Hyundai IONIQ Electric drives – so we’re hoping that the Kona Electric will share some of these genes. 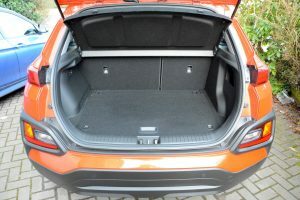 The 1-litre petrol Kona feels agile to drive because it’s so light; it will be interesting to see how this agility is impacted by the added weight of the Kona Electric’s battery. 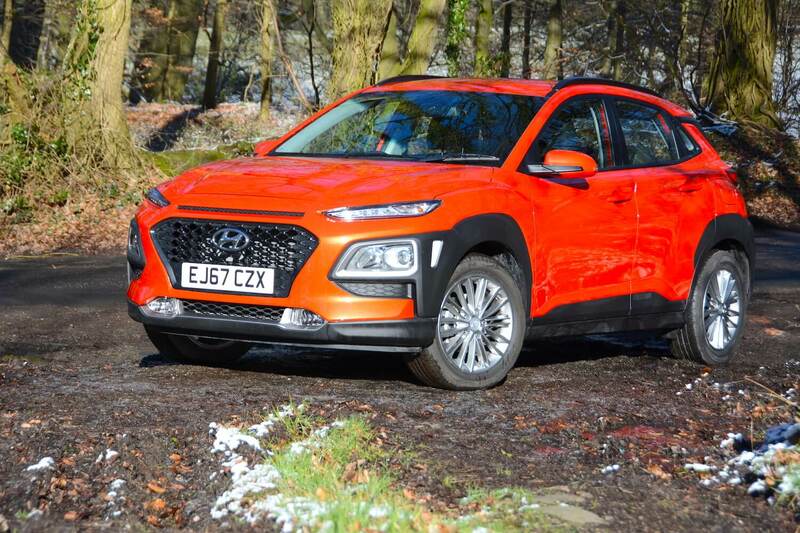 Anyway, in the meantime, the Hyundai Kona SE 1.0 T-GDi 6-Speed Manual 120PS is awarded a Green Car Guide rating of 8 out of 10.